Have you ever developed a bold strategic plan that everyone knew would never get done? You know what I mean – the type of team plan that has multiple goals and projects, presented as a beautiful glossy 25-page document with graphs and inspirational quotes. Last year I was contracted by an executive team to help roll out their 3-year strategic plan. They had spent the last five months developing a comprehensive document, supported by an alphabet consulting firm, yet had no idea how to implement their plan. They didn’t know how to communicate their plan in a simple way. They didn’t know how to inspire staff to take it on. Their plan had not been designed with execution in mind. It was complex. It was exhaustive. It was functionally useless. Deep down, the CEO knew this to be true. Simplicity is essential for execution. As I dug deeper, it became apparent that the entire leadership team was sceptical about their own plan. It was bold and inspirational, but way too complex to remember. It presented well as a PowerPoint, yet wasn’t able to change behaviour on the ground. One executive sheepishly admitted to me that they had developed plan after plan over the last ten years, without actually achieving any of them. No wonder his staff had become sceptical. No wonder they had stopped believing in meaningful change! Simple plans get done and complex plans get shelved. I suggest that we need to design our strategic plans by starting with the end in mind — that is, not with a glossy brochure or inspirational speech, but with a clear, memorable and workable plan on a page that can actually get done! Most strategic plans are way too complex. They try to include everything and end up achieving nothing. Research suggests that when it comes to strategic planning, less is most definitely more. Take goal setting for example. The Franklin-Covey Institute ran a series of studies to track how consistently teams achieved their goals. What they found was astounding, yet matches our experiences on the ground. The fewer goals that an organisation sets out to achieve, the more likely they are to achieve them. Set one big goal and you are highly likely to achieve it. Set four big goals and you may achieve one, or you may achieve two. Set more than this, and the likelihood of achieving any goal goes down significantly. The lesson is simple. If you dilute your time and attention across multiple goals and projects, then nothing meaningful gets done. No one gets inspired. They just get confused. 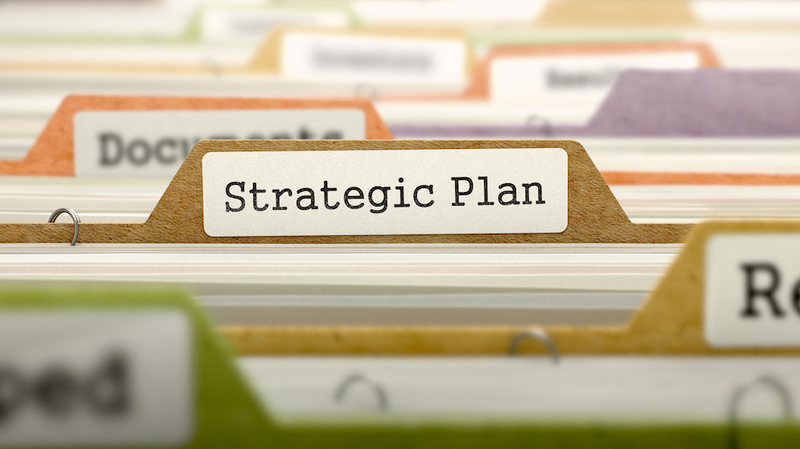 Is your strategic plan executable? Here’s a simple test. I call it the stupor test! Now, this is obviously tongue in cheek, but it’s a good test of simplicity. If I was to wake my team in the middle of the night, I suspect they would be both surprised and grumpy, yet I guarantee they could still recite our main goal. For the next six-months we have committed to “Experiment Like Mad”. This means that Tim is developing a team-based training course called Meeting Dojo. I’m writing our first business book, Space-Maker, on how to “unplug, unwind and live freely in the digital world.” Mikala is developing a series of micro-eLearning products. Matt and Carly are building capacity to broaden our offerings in Melbourne in 2018. We may have different projects, but everyone is heading in the same direction. We work as a team, review our “plan on a page” each fortnight and support one another when someone slips or falls behind schedule. Is your strategic plan simple or complex? Is it memorable enough to pass the stupor test? Do you refer to it regularly or is it gathering dust on a shelf? Is it simple, clear and workable enough to actually get done? From our experience, it is easy to develop a strategic plan, but hard to execute that plan. It is easy for leaders to come up with new ideas, new projects and new strategies, but hard to commit to stopping or delaying activities, in order to create focus. In other words, it is hard to make space. Complexity is easy and simplicity is not. A plan on a page requires deeper thinking. It requires discipline. It needs a different approach. If you need help to develop or execute your next strategic plan, feel free to contact us. Spacemakers® develops plans for teams as small as 20 people, and as large as 300. Our process is collaborative and workable, designed to produce a plan on a page that is smart and memorable. Our clients are consistently surprised by their results. Simple plans get done and complex plans get shelved. Keep it simple. Pass the stupor test. Track and review progress in real time. Go and change the world, one small plan at a time! Great article Daniel. My clients often talk about their grand plans for the future. When I check back one year later, they always have an excuse for why their plan hasn’t been executed yet. Popular opinion is that ‘entrepreneurs’ and ‘executives’ should hussle more. Burn the candle at both ends, do everything and try to do it well. If only people understood, in such a busy world, simplicity is the key. Well said.